Arik Airline has announced an acquisition deal with Bombardier Aerospace of Canada for three CRJ 1000 next generation and four Q400 turboprop aeroplanes, a deal valued at N44.5 billion. Ola Adebanji, the Head of Public Communications, Arik Airlines, made the announcement in a press statement released to Nigerian Telegraph on Thursday. 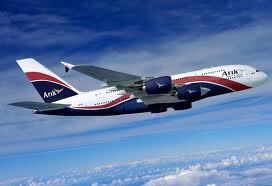 Arik Air currently operates four CRJ900 aircraft and two Q400 NextGen aircraft. “Based on the list price of the CRJ1000 NextGen and Q400 NextGen aircraft, the contract is valued at approximately 297 million dollars,” the statement read in part. “Bombardier is evolving mobility worldwide by answering the call for more efficient, sustainable and enjoyable transportation everywhere. Bombardier, which is the world’s only manufacturer of both planes and trains, is headquartered in Montreal, Canada. The company’s shares are traded on the Toronto Stock Exchange (BBD) and also listed on the Dow Jones Sustainability World and North America Indexes.